Optimists convert stumbling blocks into stepping stones. ~ W. Howard Wight, Jr.
Firstly, I'd like to say thank you so much to those who have sponsored me for the Race for Life walk I'm doing in June. I am so grateful! So far I've raised £133 online and £20 offline! I'm chuffed to bits. Just because I've reached my goal (£100) and gone past it doesn't mean you have to stop ;) Haha. I need to start walking to get in some practice for this walk, I keep saying I'll do it but I just keep putting it off! General update first and then I'll get to my appointment today. Throat feels completely fine, I have been waking up with a sore throat lately but I think that has something to do with TALKING (yes, you heard me...) - my voice is coming back! I've managed to use it pretty much all the time for the past 2 days. It's so exciting!! It sounds a bit rubbish but I think it actually sounds better than what it did before I was diagnosed. It does go sometimes but I suppose that's just because I have been whispering for the past 7/8 months. 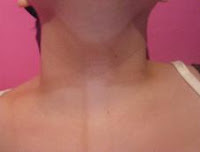 The skin on my neck is all good, I still have marks but it's faded really well and now it just looks like I need a wash or something! Lol. My back has still got the weird marks on it (from where the radiotherapy went through)...I bought some tops the other day and got home and realised that they'll show off the marks on my back! Oh well! This is my hair!! It looks darker in person...it's amost black! It feels like it's taking forever but I suppose it will. It's taken 3 months to get to this length so in August hopefully I'll be able to do something with it! I blow dried it for the first time the other day and it went CRAZY! I couldn't flatten it down. This morning I blow dried it again and my sideburns (grr) were sticking out sideways, it was really bad!! I had to wet them down and REALLY hold them down for about 5 minutes lol. I've still not got the guys to go out without a bandana on! On to my appointment! Well, it was at 2pm and I was Dr Pace's first patient so I got in the room pretty much straight away which was good because I don't like waiting! I went in, sat down, he asked the usual (how's the throat, can you swallow, how's the voice) - he noticed that my voice is coming back! I told him that I'd been waking up with sore throats for the past couple of days, so he looked down my throat (and used that nasty metal thing to hold down my tongue, hate it!!) and said it looked a bit red. I asked if it was maybe because I've used my voice all day yesterday and today and he said possibly! I also told him that I'd been getting pains in my neck and near my left collar bone (this used to happen before I was diagnosed) and he felt my neck quite a few times and said that he couldn't feel nothing which is good news. Then, he asked me which nostril I'd like the camera up (neither, thanks!!) and I said the left (always the left lol) so he put the numbing spray up there, I did the usual....sniffed and swallowed! Then I went over to the chair and he got the camera ready, I held my Mum's hand (thanks Mum lol) and he did what he had to do. He asked me to say 'EEEEE' and it actually came out for the first time...even before I knew I had cancer my voice wouldn't let me do that! Lol. He didn't say much and took the camera out. I said "ooh, that's the worst bit!" and he said "Well, I can leave it in there if you'd like" I was like "Erm...no thank you!" Lol. Mr Pace then went on to say that everything looks good down there! There's no longer any swelling so going under general anesthetic and getting a biopsy isn't neccessary!! Wohoo!! He said that he's really pleased with it. He said it's alright go ahead with speech therapy so I sent Hilary a text but she hasn't got back to me. Hopefully it'll be soon! Mr Pace-Balzan said that my voice wont probably be 'normal' because the tumour was so big and there's probably some scarring from when I had the polyp removed and from radiotherapy. But I don't care...I am grateful for a voice right now after not having one for so long. I still don't know whether I'm in remission or not because I've not had a CT scan and the radiotherapy is still getting rid of the cancerous cells apparently but I'm happy. I go back in 5 weeks (July 3rd) for another check up. Do you remember the lumps I got in my armpit? Well, it KEEPS happening and it's always in the same place. I wake up one day and my left armpit aches and then the next day the lump usually appears and by the day after that it's gone again! Yesterday night I found a bigger lump lower down though, but now it's gone. It's annoying because when I go to show someone the lump is gone so I feel like they think I'm making it up or something! Lol. My armpit is quite painful today so if it still hurts tomorrow I might go to the Doctor about it. Thanks everyone for all your support, I love reading your comments. Don't stop them!! I had a freaky sixth sense moment of thinking you'd updated and hurrah, you have! I was SO excited when I got your text, sat there grinning at work, delighted that everything went well! I can't believe you're getting your voice back already, especially seeing as you've not even started voice therapy yet!! I can't wait 'til I can pick up the phone and have a natter to you, that is gonna rock!! Well done you for smashing your £100 fundraising target...I say you up the target again and make even more people sponsor you :p Can you get Auntie Peter/Your Mum etc to spready word around work? People are always doing that at my work if they're doing a sponsored something-or-other! Just an idea. Anyway I'd better get to bed..Love you lots! PS The hair is looking fab!!! Fantastic news on breaking your initial target - but you still need more money coming in. Keep sponsoring peeps! I found you via Rosie's blog as I am a friend of hers. I have been in tears reading your journey and I think you are amazing! Congratulations on your never faltering optimism and sheer zest for life. ..where are all your commenters???? ...oh, and as always; soooooooo proud of you. WOW - Brilliant news about your appointment and looking at the pics its really good to see things are getting back to normal for you. I will sort out some sponsorship this week for you and if you don't mind I was going to put a link on my blog to your site - hopefully some of my generous contributors will see fit to sponsor you too. Well done - keep up the very very good work.